In the following correctly worked addition sum, A,B,C and D represent different digits, and all the digits in the sum are different. What is the sum of A,B,C and D? You can solve this algebraically by making a lot of equations, i.e. 50 + A + 10B + C = 100D + 43, etc. But I'd avoid that mess. When you see problems like this it's usually easier to use logic or just try digits until you figure out the logic. D looks like the easiest. It has to be 1, since there's no way you can add a 5 and a single digit to make 20 or above, which would get you a 2 or above in the hundreds place. So D is 1. Since we need a 1 for D and a 4 in the tens place, we need to add 5 and B to get 14. Thus, B is 9. Great. So what are A and C? They need to add to 3 so they must be 1 and 2 or 0 and 3. However, the problem says that all digits are different and we've already used a 1 and a 3. So both options are out. What's going on? Another way of making that 3 would be to make A and C add to 13. However, then a 1 would carry over so what we concluded in the last paragraph would need to be amended a bit. No big deal. So the carried over 1 and 5 and B need to add to get 14. So B is actually 8. Double-checking to ensure that A and C add to 13 but don't duplicate anything: 9 and 4 don't work because of the 4, 8 and 5 don't work because of the 5, but 7 and 6 would work because they add to 13 and haven't duplicated anything. So A and C make 13, B is 8, and D is 1, adding to a total of 22. So B is the answer. 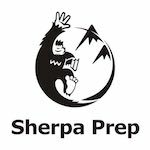 Last edited by SherpaPrep on 03 Apr 2018, 10:01, edited 1 time in total. I don't understand why D is 1. D looks like the easiest. It has to be 1, since there's no way you can add a 5 and a single digit to make 20 or above, which get you a 2 or above in the hundreds place. So D is 1. In this problem we are adding a pair of two digit numbers and our answer is a three digit number so we can safely assume that \(5+B\) is 10 or more.